Virginia's torn and cut paper collages include art papers and pieces of magazine colors and images, assembled to portray her fondness for her surroundings. 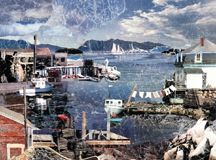 After two decades of teaching art around the world, Stonington, Maine, a working fishing village, is home to Virginia and her gallery, and life seems real. She has run her own gallery in Stonington for decades, and plans to experiment with retirement soon.